For a small town Mansfield had no fewer than four theatre buildings when I was there in 1950. On one side of the town were the Hippodrome of 1906 were live shows ceased circa 1919. This was a splendid theatre building in every way, and one might have been forgiven for thinking that it was a Matcham theatre as it had very many Frank Matcham hallmarks. In 1950 the Hippodrome was used as Granada's second release cinema. It has since been demolished. Almost opposite was the Empire of 1914, again in use as an independent second release cinema. I was not allowed to inspect this building, however, it's greatest claim to fame would seem to be that Flanagan and Allen made their first appearance as a team here in 1926 in Florrie Ford's revue; "Flo & Co." Chesney Allen was in the show and was the company manager. Both men had come into contact in the army during the Great war; both had been on the stage before the war, Bud Flanagan, among other things as the Harlem of an act called Harlem and Bronx. Chesney Allen had been the juvenile lead in the Percy Lodge Stock company which hailed from the North East of England. Early in the Great war they seemed to be touring the West Country Albany Ward circuit to theatres with; "The Coastguards Daughter." The swan song of the Percy Lodge company seemed to been an engagement at the Theatre Royal Winchester in September 1915. Chesney played the part of a young Naval Officer wrong accused of deflowering the Coastguards daughter. In the Court Martial scene which preceded the interval, Chesney, found guilty, fell to his knees proclaiming; "What is to become of me now? "; there was always some wag on hand to shout out; "Why not join the Army mate" and it would appear that Chesney done just that. The Empire has also been demolished. On the other side of town in Leeming Street there were two more theatres almost next door to each other. The Grand of 1906 was rebuilt internally in 1928, it had a very large stage 40 feet deep and a grid 60 feet high and was capable of taking the largest touring shows. There was a very large circle with three boxes each side, at circle level, with a Juliet balcony above each box. In 1950 the main use of the Grand was as an ABC first release cinema, however, there were occasional live shows which included full weeks of Big Name variety, Ice shows and Musicals by the Local Operatic Society, their 1950 production being "Showboat." This Theatre seated around 1400 and still stands although used for other purposes. The Palace opened in 1910 as the Electric Palace presenting Cine-Variety. In 1950 there were signs of a partial refurbishment of the Palace which would have seated around 600 in stalls and balcony, there were just plain side walls, a very small stage and the follow spotlights were, unusually, operated from a projection room at the rear of the Stalls. You will see on the Programme (shown right) that the Direction was in the hands of Will Collins, this would have been the well known agent Joe Collins who often used his Father's name in business matters. Joe was the father of Joan & Jackie Collins. Will Collins was also a well known agent, who died at the young age of 39 on 17th June 1915, the result of a blood clot in his leg which was the result of an incident at the Shepherd's Bush Empire a few weeks earlier. Will was watching an act of his, a girl being spun around the stage in her partners arms when a belt came off her dress, she stooped to pick it up whilst the acts music was still playing. Will considered this unprofessional and came backstage and had "words" with her about it, her partner who was also her husband, named Larry Sebellas, objected to Will's behavior, there were fisty-cuffs during which Will was kicked badly on the shins. 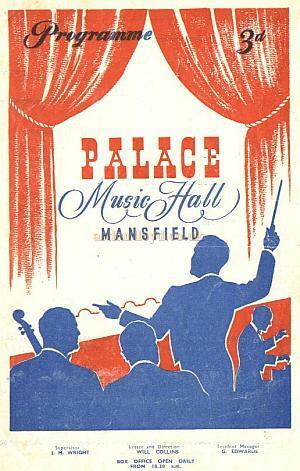 Right - Variety Programme for the Palace Theatre Mansfield in February 1950 - Courtesy Alan Chudley. Refurbished and with a new stage-house, The Palace now serves as a Civic Theatre. It always amazes me how these smaller theatre, often known in the Variety fraternity as ;"Daisy Dates" still operate as live theatre when the bigger and grander theatres bit the dust half a century ago; When I worked in the Aldershot Hippodrome in the 1940s, I often, as was the wont of young assistant electricians, apt to act the clown, only to be told by Jack Soles the dayman; "You will finish up at the Grand Basingstoke, my lad." The Grand Basingstoke, at the time under the direction of Will Hammer, was the Daddy of all Daisy Dates; The Aldershot Hippodrome, one of the better Number two theatres, vanished many years ago; the Grand Basingstoke, refurbished as the Haymarket theatre is still a working Theatre. The late Drury Lane Theatre historian Walter McQueen Pope, used to say that the truth about the theatre was that it was stark raving mad, how right he was, but I am pleased to have been part of it. Text kindly written for this site by Alan Chudley.